I've been blogging for almost 12 years. It's a little crazy to think about how many posts have been written, published and shared in these past dozen years. It's also a little crazy to think about how much things have changed since I created my first blog—back in November of 2002, back when I was still a teenager, back when we still had a dial-up internet connection, back when the only things I had to worry about were community college classes, a part-time job at the local mall, and my many irrational crushes. I've written down these pieces of my life on three different blogs, throughout so many different seasons of life, sometimes to an audience of one, sometimes to a handful of friends, sometimes to an audience of what tends to be mostly-strangers. I've shared everything from the utterly pointless to big, life-changing events. Most importantly, I've also created friendships with people I would have never known without this ol' blogosphere, and am a better person because of each and every one of them (odds are, if you're reading this post, I'm talking about you). The quote at the top of this post is something I came across a while back, and the words have been at the forefront of my mind ever since. Whenever I sit down to write, something holds me back. Whenever I want to write, the words don't seem to come as freely as they used to. Whenever I think about what I want to share here on my blog, I tend to overanalyze how I will come across or how my words can be misinterpreted, judged—even mocked. Whenever I do actually post something, I'm very aware of the fact that I don't have any idea who will come across my words or photos. Not only have I changed in so many ways since my very first posts, but the whole landscape of the internet, blogging and social media has changed, as well. I know I talked about this a bit when I wrote last year about introversion and the internet, but I can't help but mention it again: These days, blogging seems to be less about journaling your thoughts and more about social interactions. I've fallen prey to this way of thinking, obviously, because the way I blog has changed a lot in the past few years. I've jumped on many a bandwagon, for a variety of reasons. And that's not to say that this change is necessarily a bad thing for everyone…I know some people who are thriving because of the way things are now. Part of me just…misses smaller circles. It's hard to put a lot of what I'm thinking right now into words, because I'm afraid some of it will come across as snobby or something of that nature, but at a certain point I've come to the realization that I'm not the sort of person who always wants to share my heart with an audience I may not even know. I've become selfish with a lot of my life when it comes to sharing the details and day-to-day struggles and celebrations. My blog has turned from an overflow of my heart to something much more filtered. Which is a good thing in some ways, I'm sure. I remember how much I wanted to write when my daughter was first born, but I didn't actually sit down to write very much at all. A lot of times, it ended up making me feel guilty when I did spend a fair amount of time creating a post…it was almost like wasted time, in my mind. You're a mom now, with so much going on, and you really should be doing something more beneficial—not writing about random odds and ends on your blog. To be honest, I still struggle with rationalizing so much time spent online without it bringing in some sort of income. That's why I do reviews here and there, post affiliate links, and also tried to sell ad space for a few months. When I do post more, I feel so much pressure to have it be like a job in order for it to be worth my time. What's silly is that I still often compose posts in my head. While on an evening walk, after a ridiculous event in toddler motherhood, when something especially heavy is on my heart at the end of the day. I actually come up with the sentences and paragraphs, telling myself I'll type them up tomorrow or the next day—even though I rarely do. Because putting things into words has always calmed me and helped me sort through all kinds of emotions. It's sometimes hard for me to realize that no matter what, I can never blog the way I used to. And to also be forgiving of myself, because it's not necessarily a bad thing, either. If I spent half as much time as I used to online, I would be a stranger to my husband, child, and the rest of the world. To keep things in perspective, I have to explain that when I did the most blogging—my busiest year being 2009ish—I had a desk job. I worked customer service at a private airport (think corporate jets and single engine aircraft) and typically worked late nights or early (like, 5:30AM early) mornings, often times hours would pass between interactions with customers. I became a bit spoiled, because any time not spent on paperwork or with customers meant that I could have a lovely time writing, on social media, reading other blogs, and other such things. I could do this for hours a day, and it was rather nice because I felt like I had so much to share. I could keep up with a huge number of blogs, I could make time to comment (and reply to comments), I could write lengthy emails, I could hang out on Twitter like it was my job (I mean, technically, some days I was basically being paid to be online and eat free cookies—not too shabby for a twenty-something). And here I am now. I feel like it took me at least two years of being a mother to get into a comfortable enough schedule, and can now (mostly) rationalize taking time to blog and do other internetty things. But still, as I post more creative and lighthearted and simple things, I will miss having the luxury of spilling my heart out onto the "pages" of my blog, and not worrying about who would read or how it would be interpreted or whether or not I need a fancy image for my post or when I should post it to social media. Truth be told, I rarely (if ever) have time to read other blogs. I'm dreadful at answering email. I love my iPhone, but I had to delete my Twitter app because it was the worst time waster of all time. Sometimes weeks will go by between posts on this blog. I don't think I could ever be a good blogger, not by today's expectations. Some people are so good at it, but I am not. But then I think about that quote again, and I realize who I do share my life with these days. Who are the people I share my heart with now, during this season of life? Do I take the time to nurture the relationships with my best friends, sisters, parents, and other people that deserve the extra effort? I'm an introvert, I'm a home body, I'm sensitive, I'm not out for a debate or anything of that nature. In the past year alone, I've become much more settled in my beliefs, priorities, convictions. In many ways, I just want to share my life with people I know and trust and see face-to-face…or phone-to-phone, as is usually the case with my family, who lives states away. Well, anyway. I've gone on and on with no real direction (and Eisley just woke up from her nap, so real life calls!). When it comes down to it, all I want at this moment in time is for the world to be smaller, for things to be simpler, to just go back. So, perhaps it's only natural for the way I share (and the things I share) to have changed. For some reason, I just felt the need to write it out and explain where I'm coming from at this point in time. I'm there are some other people who have been blogging for a long time who will understand, at least a little bit. We'll see where it goes from here, right? Ebbs and flows. In blogs, as in life. I feel you. I've also decided to bring my blog back to its roots. I want it to be more about my writing and not so much about sharing. The right people will read it at the right time and I am not going to stress about numbers. Writing and blogging will be my stress relievers, not my stressors. I've been reading for years now, sometimes commenting, sometimes making etsy purchases from your shop. I love that we all have the freedom to write when we want to write, and comment when we can. It's ok to not blog, you're not failing or letting us down just in case you're worried I wanted to tell remind you. You're a mom, a wife, a friend, a sister, a daughter, and each of those callings bring you different experiences, priorities, and desires. You're missed when you don't appear in my feed, and you're welcomed back when you do. But don't be hard on yourself. Why do you blog, what's your goal? Why do people read? I just like knowing you're doing well, living life and sharing experiences. I'm fairly new to blogging ( I think it will be 2 or 3 years this summer) and I've definitely struggled lately with what to write about that I WANT people to read ( especially knowing a lot of my family & coworkers follow it). Part of me wants/likes the privacy part, but another part of me wants to put my writings/feelings out to the universe too and feels guilty when I can't express myself in the way I want. I'm trying hard to overcome that guilt feeling and keep the blog as I wanted it to be when I started out- as a space for sharing about my life and ideas, projects, etc. I think the evolution of our blogs/frequency of posting/what we share, etc. shows our true self and in writing about that struggle, we represent ourselves better to whoever is out there reading us too. I like to think that blogging is like having your own little corner of the internet, and I like that you can make what you want of it. 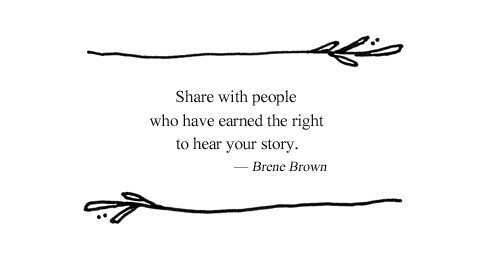 Share, or not. I'm glad I'm not the only one who composes posts in her head and then doesn't post them :) Also wow, 12 years! High five you, that's amazing. I've been thinking about my blog lately, too. I don't consider myself a writer but I do like the kind of writing that I can do on my blog. Sometimes I feel good about sharing my heart, but it's also a fun hobby for me to write about lighter things. Right now my job is much slower than I'm used to so I've been posting a lot more frequently. Part of me feels the pull to try and use it for income (and I have no problem using affiliate links or doing an occasional sponsored post that makes sense for me) but my gut says that since this will never be my full-time job I should keep it as a hobby because I want to be present in my real-life relationships. For now I am still enjoying the increased posting and I'm going to try and keep it up as long as it's still fun and not stressful, but reading your post today and thinking about this stuff has made me feel good about just keeping it as a hobby. I wonder how much of it is just getting older - we don't WANT to share everything with everyone anymore - and how much of it is the changing nature of blogging (ie: seems to be hyper-intense or give it up all together). I totally get the pull or guilt about spending time online in terms of bringing in income - but you can also be kind to yourself and see some of the time as self-care. Investing in your own hobbies and happiness will make you a better mom! Whether that's blogging, talking with other mamas on social media, whatever it is that gives a sense of connection to yourself and others, you know? Then get rid of whatever DOESN'T make you feel that way. Gotta make room for the good stuff by getting rid of the bad! I seriously love this so much Kerri. I've been feeling quite similar lately with my blogging and writing and just everything. It's hard where to know how to move on and continue doing something we love and keep loving it without it feeling like a burden. I like what Kristan said about "ebbs and flows"... so true! I kept nodding as I read this post, because I've been at this point for, oh, maybe five or six years now--and it was a similar time in my own life, when my first child was two-ish (he is now almost EIGHT...whoa! heh). I took breaks when I felt like I needed it and came back when I felt like I needed it, and right now it helps me as an off-and-on outlet. Still mostly a journal-y type of thing. And I too miss the way things used to be, as you mentioned, with smaller circles and closer connections.